For the three astrophysicists who won the Nobel Prize in physics today (Oct. 4), it was only a matter of when, not if, they would get the prize, their peers said. Their discovery that the universe's expansion is accelerating was an Earth-shattering revelation that led to the bizarre concept of dark energy. For such a monumental find, experts said, the Nobel was inevitable. "We expected it from the day the research paper was published back in the1990s,"astrophysicist Neil deGrasse Tyson, director of the Hayden Planetarium at the American Museum of Natural History, told SPACE.com. "The fact that there's a committee in Sweden who agrees with what we've known all along is not a surprise to us in the astrophysics community. It is a discovery that's bigger than the prize itself." The Nobel Prize committee announced the decision today to award 2011's prize to Saul Perlmutter of the Lawrence Berkeley National Laboratory and the University of California, Berkeley; Brian Schmidt of the Australian National University; and Adam Riess of Johns Hopkins University and the Space Telescope Science Institute. Scientists were left scratching their heads regarding the cause of this speeding up of the universe's expansion, which wouldn't be possible unless there was a force working against the inward pull of gravity. This force they have named "dark energy." "All we can say is that there's an entity that is forcing the universe to accelerate outside of the wishes of gravity," Tyson said. "The term 'dark energy' seems apt, but we don’t know what it is — that remains a mystery. The Nobel is for the discovery of this mystery." The researchers, in fact, had set out to find the opposite: to measure just how much the expansion of the universe was decelerating, as it was expected to do because of gravity. "They wanted to know to what extent gravity is slowing down the expansion of the universe — and their rivalry to 'get there first' was fierce," said journalist Richard Panek, who wrote a book about the discovery called "The 4% Universe: Dark Matter, Dark Energy, and the Race to Discover the Rest of Reality" (Houghton Mifflin Harcourt, 2011). "What they discovered instead is that the universe is doing the opposite of what they expected — that the expansion is speeding up under the influence of some force that, on the cosmic scale, is overpowering gravity. Scientists want to catch the universe doing something weird, and they caught it doing the weirdest thing of all." The mind-bending measurement, made by studying faraway star explosions called Type 1a supernovas that allowed the researchers to precisely measure cosmic distances, shook all of science. "It was revolutionary for physics and cosmology," said John Carlstrom,director of the Kavli Institute for Cosmological Physics at the University of Chicago. "The acceleration and that there is some sort of dark energy is now widely accepted by experts in the field. Now if only we could understand what the dark energy really is! That is one of the biggest mysteries in all of physics." 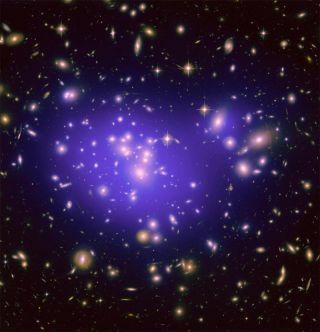 "Arguably understanding the nature of dark energy is the biggest challenge that physics is facing today," said Mario Livio, a colleague of Riess' at the Space Telescope Science Institute. "While dark energy has not played a huge role in the evolution of the universe in the past, it will play the dominant role in the evolution in the future. The fate of the universe depends on the nature of dark energy. I am clearly very excited about Adam, Saul, and Brian winning the prize." And the significance of the discovery extends even beyond the fate of our universe, to the question of whether there are in fact multiple universes, with different amounts of dark energy in each. "The discovery was amazing," said Harvard University theoretical physicist Lisa Randall, author of the new book "Knocking on Heaven's Door: How Physics and Scientific Thinking Illuminate the Universe and the Modern World" (Ecco, 2011). "For many, it changed their research agenda. I speak especially of those who work on the 'landscape' of multiple universes and the 'anthropic principle' that says we can live only in a universe with such small dark energy."